We have an addiction with a certain vegan maple breakfast sausage over here. Fellow seitan-loving Americans probably know which ones I’m talking about. And while we’re probably not going to stop buying them anytime soon (hello, convenience), I wanted to make a homemade version! 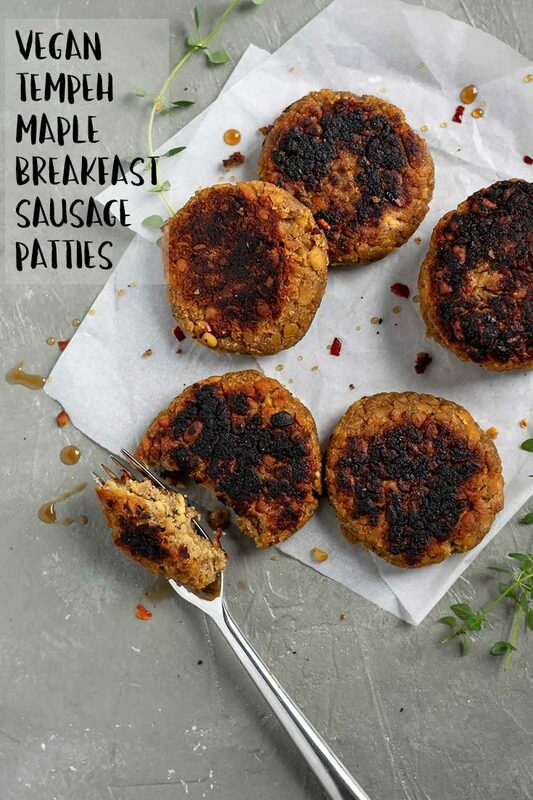 And so, these tempeh maple breakfast sausage patties were created. 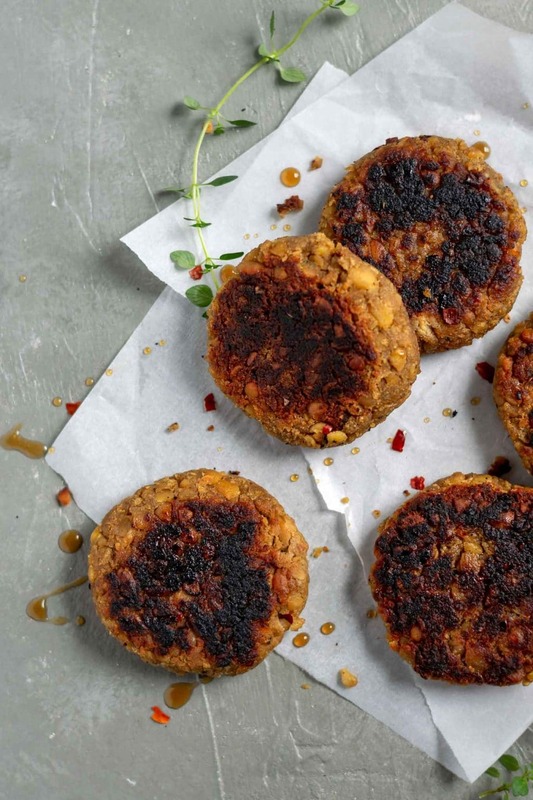 A hint of smokiness, a little maple-y sweet, lots of savory flavor bundled up in a toothsome patty. They’re perfect for your on-the-go breakfast or your casual brunch. They come together fairly quickly, and require no fancy equipment. A pot to steam your tempeh, a mixing bowl and your hands to mash it all together. My kind of recipe! Tempeh is such a great source of protein. It’s made by fermenting soybeans, which makes it’s protein more bioavailable and means it is easier to digest. And because it’s made of whole soybeans it is a good source of fiber plus it’s a complete protein! 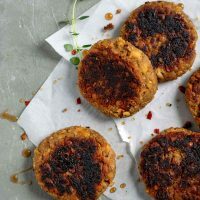 To top it off, it has a great toothsome texture, which makes it perfect to use in these vegan sausage patties! 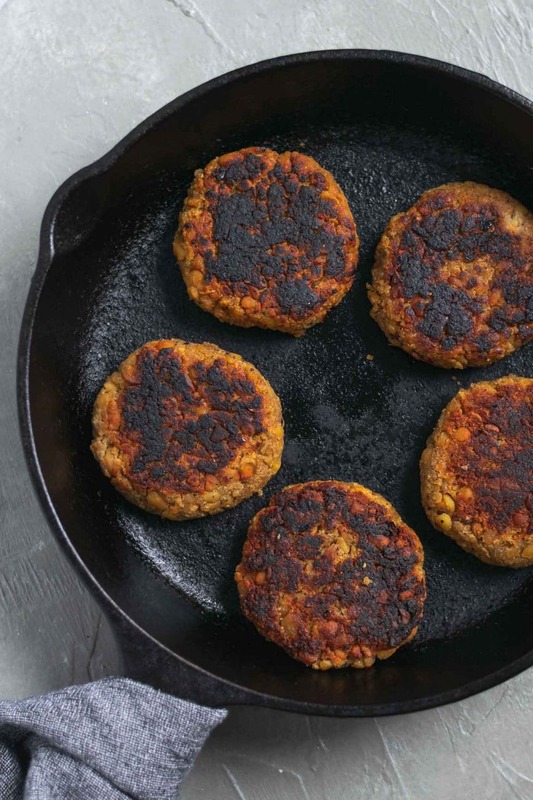 The first step to making these vegan sausage patties is to steam them. Steaming softens the tempeh also removes potential bitterness. We also infuse the tempeh with soy sauce and olive oil while steaming to get the flavor building started. Next we twiddle our thumbs and maybe do a little dancing while the tempeh cools enough to touch (about 5 minutes if you stick it in the freezer), then add in the rest of our spices and flavors. Garlic, because what better way is there to start your day? 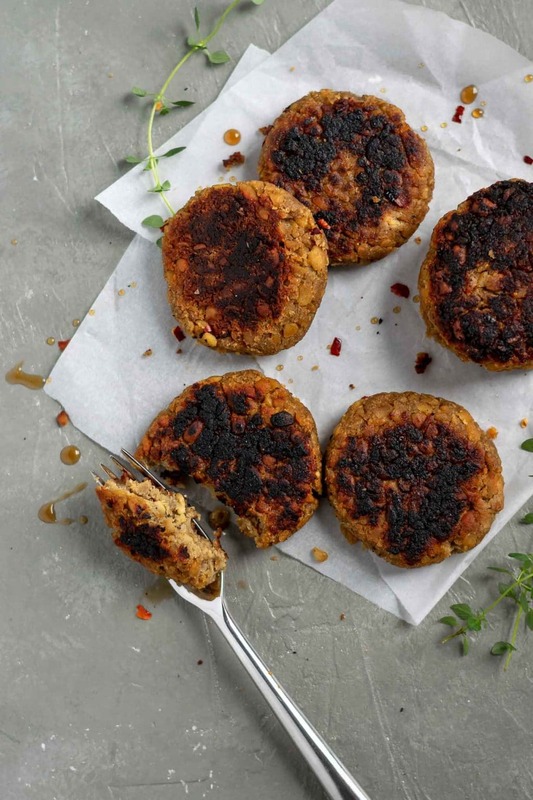 Just kidding, a little garlic provides a pungent kick and a savory base to our sausage patties. Maple syrup, because you can’t have a maple sausage without some maple flavor. 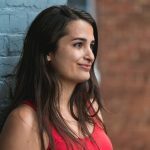 Adding just enough for a little sweetness and a touch of maple flavor without overpowering, especially when the sausage is paired with other savory foods. Though it seems counterintuitive, a bit of sugar actually enhances the savory flavors. Worcestershire sauce adds a complex flavor, sweet and savory and even a bit tangy. It’s a fermented sauce and a little bit adds a lot to our sausages. That being said, most Worcestershire sauce contains anchovies so make sure to seek out one labeled vegan or you can try making your own! Next we add a dash of liquid smoke for some smokey flavor. Dried sage because its earthy flavors complement the sweet maple flavors and it’s commonly paired with meat and sausages. Dried and powdered onion for its mild but concentrated oniony flavor. I like my sausages to have a little bit of a kick to them, so generously add ground black pepper plus a sprinkling of crushed red pepper. A little salt and that’s everything! Well flavor-wise. The last ingredient is bread crumbs, which are mashed into the mixture and bind everything together. Squeezing the mixture in your hands it’ll mash the tempeh enough to form a sticky mixture, which is then held together with the dried breadcrumbs. If it’s a bit sticky and not holding together you can adjust and sprinkle in some more breadcrumbs. I divide the mixture into 6 equal parts and form patties, which are fried for a few minutes per side. Then enjoy them hot, alongside breakfast potatoes, a tofu scramble, and some toast or perhaps even some vegan jalapeño cheese biscuits! See, being vegan doesn’t mean you can’t have your hearty and protein heavy American-style breakfasts! I hope you guys enjoy these breakfast sausages, they really hit the spot! Also, you’ll probably want to use these in my delicious vegan breakfast egg and sausage muffins! Looking for more tempeh recipes? There is plenty more where this came from 🙂 . In the US there are at least two commercially available vegan Worcestershire sauce brands: Annie’s and Edward & Sons The Wizard’s. You can also try making your own! Gluten free option: use gluten free breadcrumbs, tamari, and a gluten free vegan Worcestershire sauce. 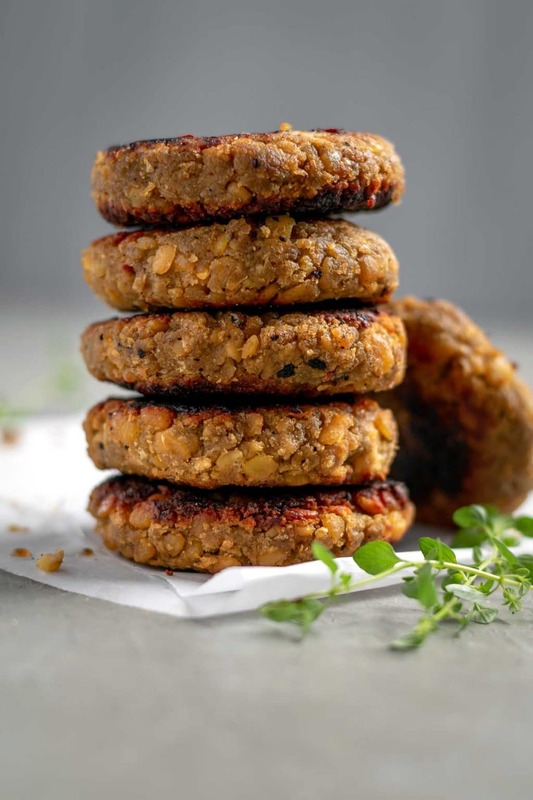 These toothsome maple sage tempeh sausage patties are perfect for your vegan breakfast or brunch. Enjoy with toast, a tofu scramble, and some homestyle potatoes, or use them in a breakfast sandwich! They're easy to make and super delicious! Crumble the tempeh into a small pot and add the water, soy sauce, and olive oil. Bring the pot to a boil, then lower the heat and simmer with the lid ajar until the water is gone, 10-15 minutes. If after 15 minutes there's still some water, drain it. Put the tempeh in a mixing bowl and leave to cool enough to handle. You can put the bowl in the freezer for about 5 minutes to speed up the process. Add the garlic, maple syrup, Worcestershire sauce, liquid smoke (a couple drops), dried sage, onion powder, salt, pepper, and crushed red pepper and mix to combine. Then, add the panko and use your hands to mix together, squeezing to mash slightly, until the mixture holds together nicely. If it remains loose, you can more bread crumbs, 1 tablespoon at a time, until it holds together. Divide the mixture into 6 equal parts (~60g or 1/4 cup) and form into patties. Fry over medium heat in a little oil until golden, about 4-5 minutes per side. Adapted from the tempeh meatballs in Isa Does it.